Pot comedy icon Tommy Chong learns how to grow weed by remote control from his smartphone in the new HIGH TIMES Tech Issue. The list of films accepted for the 12th annual New Hampshire Film Festival, has been released. The festival takes place at various venues throughout downtown Portsmouth on Oct. 11 through 14. Tommy Chong will be on hand to promote Cheech and Chong's Animated Movie. This Branden and Eric D. Chambers' film creates an animated story using classic bits from Cheech and Chong albums. Cheech and Tommy even recorded new songs for the film. The release date is unknown at this point. In Potcast #4, Demons and Critics, Tommy Chong talks about pot, families, kids living at home and other randomness. Alleged wife beater, Cheech Marin, received the Outstanding Career Achievement award this past weekend at the ALMA Awards. Cheech is a regular at this award show so I guess they figured they'd reward him. He's a regular because he likes going to the gifting tent before the show and also gets a nice gift basket for showing up. This is also why he does all the charity golf tournaments. What has Cheech done to deserve this award? Nash Bridges? Golden Girls' Golden Palace? Nothing really, he's just a millionaire that spends his money on Hispanic art for his mansions. He then gets Target to sponsor an art tour. All his art becomes an IRS write-off and he gets paid by Target. Maybe he should win this award for this smart business dealing. The ALMA Awards, which is hosted by George Lopez and Eva Longoria, airs on NBC this Friday. ABC used to air it, but the ratings were so bad, they dumped it. BlackDeadNighmare posted his review of the Cheech and Chong skateboard from Flip. He says the board wore down really fast. The kevlar on top ripped after the second use. You can barely see the Cheech and Chong graphic on the bottom anymore. PORTSMOUTH — TV sitcom star Mike O'Malley, actor and director Tommy Chong and author Joyce Maynard will all be guests of the 12th annual New Hampshire Film Festival. The event will be held Oct. 11-14 at venues throughout downtown Portsmouth. O'Malley was born in Boston, raised in New Hampshire, and attended the University of New Hampshire. He has appeared in the CBS sitcom “Yes, Dear," Fox's “Glee," and in movies including “Leatherheads," “Eat Pray Love” and “Cedar Rapids”. He has made guest appearances on “Parenthood”, “My Name is Earl," and “Parks and Recreation." He is also a published playwright, and is currently a writer on the third season of the hit Showtime show “Shameless”. He will be at the festival promoting his film “Certainty." O'Malley wrote and co-produced the film. “Certainty” is about a 20-something couple, Dom and Deb, who are finally getting married after a long relationship. But before they can tie the knot, they must participate in a "Pre Cana" retreat, the mandatory course for couples looking to be married by the Catholic Church. “Certainty” will open theatrically in New York on Nov. 30 and will be available on Movies on Demand, iTunes, Amazon Instant Video,YouTube Rentals, Cinemanow, Playstation, XBOX, and Vudu, starting on Nov 27. “Certainty” will be screened during the New Hampshire Film Festival's New Hampshire Night, Thursday Oct. 11. Stay tuned to www.nhfilmfestival.com for scheduling information. Chong is a Canadian-American actor and director, most famous for being one half of the stoner comedy duo Cheech and Chong, alongside Cheech Marin, and for playing Leo on “That 70s Show”. He was a guest of the festival last year, and his daughter, actress Rae Dawn Chong, is a member of the NHFF board. Chong is promoting his latest film, “Cheech and Chong's Animated Movie”. Joyce Maynard is a native of Durham and a longtime resident of Hillsboro and Keene. Maynard is the author of 14 books, including the best-selling memoir, "At Home in the World" and the novel "To Die For," which was adapted into a film directed by Gus Van Sant and starring Nicole Kidman. Maynard's novel "Labor Day," set in New Hampshire, was adapted for the screen by Jason Reitman, who is also directing the film, which stars Josh Brolin and Kate Winslet. Maynard will be judging the NHFF Screenplay Contest. Yesterday, Cheech Marin, threw out the ceremonial first pitch at the Houston Astros game. "They asked me throw out the first pitch, and they paid enough money so here I am," Cheech said. "I'm a collector, but I also love baseball." 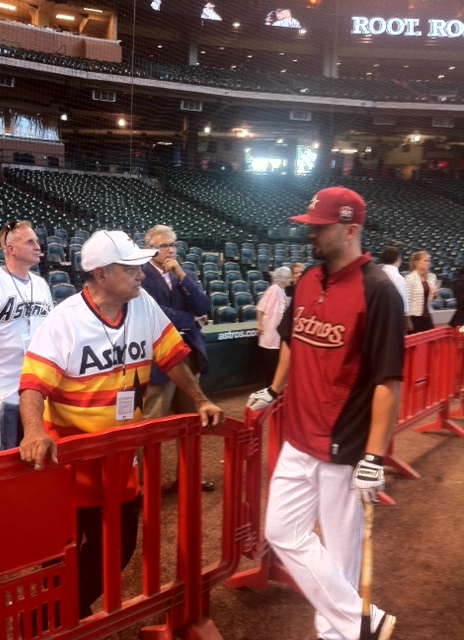 Cheech was wearing a vintage 1980s-era rainbow Astros jersey. "It [Houston] has the best combination of good-looking girls and barbecue in the world," he said. In Potcast #3, Tommy Chong has announced that treating his prostate cancer with hemp oil is not helping. No duh! Keep in mind that a few years ago Tommy told me he was going to one of those trendy California clinics to have oxygen or something injected into him. Today's podcast is a painful, whopping 42 mins long. Besides health tips from a crazy man, he plays what sounds like the soundtrack of Slumdog Millionaire. He says now he's going to try ultrasound to treat it. Chong's, 74 now, is like a mad scientist. I think the state needs to appoint him a nurse or a guardian. During his Potcast, Tommy Chong announced that he and Cheech are going to have a traveling art show, The Art of Cheech and Chong, soon. Cheech will have his Chicano art, Chong will have his art which will include his bong collection. In addition, there will be videos of their movies, outtakes that no one has ever seen before, a low rider car, possibly the Big Green Van from Up in Smoke. 1. Tommy has spoken of having a bong museum before. Years ago, he even went so far as to lease a place for the museum (which seriously pissed off his wife, Shelby). 2. I seriously doubt there are any more outtakes from their movies. Otherwise, they would have been on the DVDs. 3. I'm friends with the owner of the Big Green Van from Up in Smoke. Cheech and Chong haven't even contacted them. In conclusion, I think this is another idea that Tommy has which will never happen...just like his museum, Up in Smoke 2, Best Buds movie, etc etc. I doubt he even spoke to Cheech about it. Reminds me of the old days when he'd start selling a Tommy Chong comedy CD that wasn't even done yet and then kept buyers waiting for one year because he couldn't decide what artwork to use on the cover. Tommy Chong's podcast #2, I mean Potcast, is called This One's For All the Daves. If you don't know how to access a podcast, the easiest way is to search for it in the iTunes store....or just click here to get there directly. Tommy Chong starts off by apologizing to Dave in Canada, the guy that wrote the Dave's Not Here sketch which Cheech and Tommy lifted. Then, he apologizes to all the Daves who people have said 'Dave's not here' to over the years. He goes on to talk about how he became part of the black culture. Discusses his black wife, Maxine, as well as performing and getting high while being in a black band. Tommy Chong also announced that he and Cheech are going to have a traveling art show, The Art of Cheech and Chong, soon. In Cheech and Chong's Next Movie, Pedro and Man drive their van onto the front lawn of a house and then crash through the fence when leaving (remember Hey Bendejos!?). 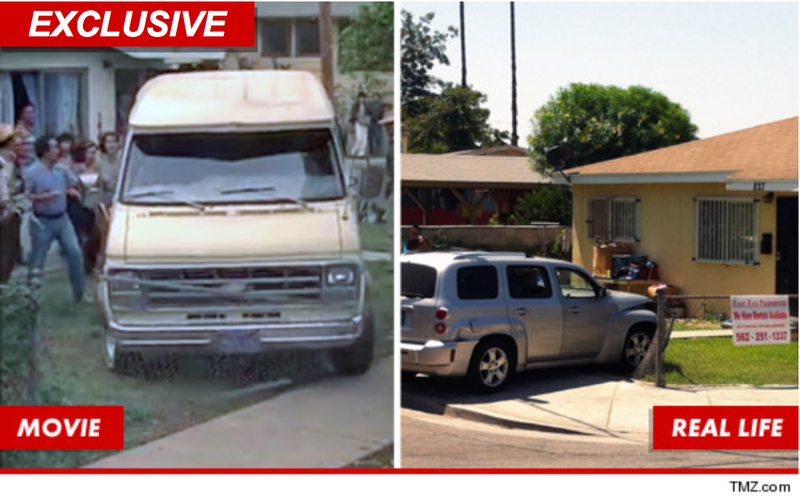 TMZ reports that now, thirty years later, a Chevy HHR drove through the same exact fence. And...the owner of the house didn't even realize he was living in the house where the movie was filmed.